A subscription to Daily Bread will ensure that you receive four editions of the booklet over the year, for free delivery within Australia. 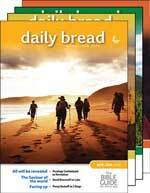 Daily Bread is the Bible reading guide that aims to help you hear from God as you read the Bible. There's three months worth of dated material that provides real inspiration each time you read it.